I'm new to the Nomad crowd as I just obtained our first Nomad ('55). I am looking at installing a 4 link rear suspension in place of the original leaf springs. Do I have to remove the original spare tire carrier? Also, do I have to replace the original fuel tank? If so, do you guy's have any suggestions as to a replacemment fuel tank and suggestions for a replacement panel located for the original spare tire location? Wow you picked a doosey of a topic here. The manufacturer of the 4-link will dictate the other questions answers. If you go with one that will mount very snug to the frame then you may not need to do any modifying, however if you use one that has substantial gap between the frame and its mounts then you will have to make changes. I would say that you are okay with the spare tire carrier, but the gas tank will have to go. In which case you'd either have to remove the carrier anyway and make a flat floor for a car tank to reside in that area under the floor, or run a fuel cell inside the wagon. I would think you'd prefer not to have the fuel tank in the passenger area. There isn't a whole lot of room in there for the tank and the exhaust to begin with. Start cramming four link bars in there as well, and there will be no room for anything except maybe the exhaust. As the others have said, one change will force another. I was told some time ago that you need to remove or modify the stock tank if you were to change to a 9" rear in any wagon, dont know if it is myth or fact but others here may have done that conversion. Another option is to use a 10 or 12 bolt, but dont know how much clearance you have with those rear ends - again, others here may be able to help on that one. I have removed the tank and spare wheel well in my 57 Nomad (with early Corvette rear) and I have widened a sedan tank by about 7". Depending on how you want to detail the undercarriage - you can get a custom made tank in stainlees or aluminium. After conferring with multiple individuals on this topic, I have decided to stay with the leaf springs. I will utilize the kit that moves the springs directly under/into the frame. I'm told that I can put at least a 10" wheel under the wheelwell with the leaf springs moved inward. I decided against the 4 link because I really don't wish to remove the spare tire carrier and install an after market fuel tank. I do plan to go with a 12 bolt rear. I hope that the original fuel tank will still work. The bars and the rear end can be made to fit, but the springs and shocks are where the tank will interfere. Here is what I started out with and even made the adjustable bars but went to air bags over leafs, good day, Henry. Did everything fit fine on the Nomad? What about the 12 bolt rear end, how did that fit? I am ordering the same setup for mine (moving springs under frame). I am using the 2" drop rear leaf springs. Do you know if that will create any clearance problems? I wish I could give you a correct answer, but unfortunately I can't. I ended up going with a 9" complete with disc brakes. It looks like I shouldn't have any problems with the spare tire carrier. I'm hoping for the same with the fuel tank. 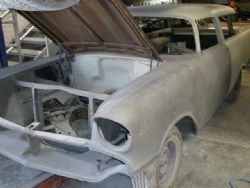 I currently have the car in the body shop getting ready for paint. Unfortunately, the car wasn't in nearly the condition I thought it was. It's still good, but I am replacing a lot of metal in the pan area. I'm replacing both the inner and outer rocker panels as well as some quarter panel work. Doors were awesome & the two front fenders were beautiful. The hood is in great condition too. The car comes back off the frame tomorrow and will be placed on a rotiserie. We will completely sand blast both inside and out. And again, I'm going to replace everything that's needed. I will be doing this right! Hope your project is going well. I have thought about the 2" lower rear springs as well. I guess I'll cross that bridge when I come to it. 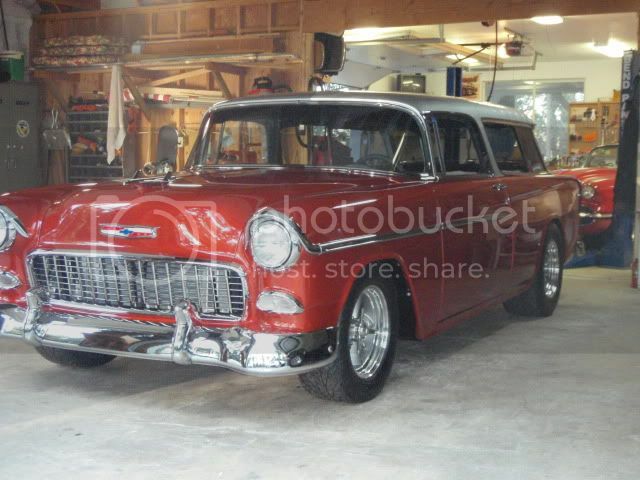 I just ordered a 9" for my 56 Nomad. I was told there would be no clearance problems as long as they made the housing a "Housing centered" and not a "Pinion centered" housing. What this means is the housing for the 3rd member is mover a little less than an inch to one side which allows clearance for the rear up against the tank. I spoke to Bill Thomas who has been building rears for 30 years and got that info. Currie also uses the same method. Sounds like you are doing a nice restoration. I will let you know what works for the rear on my Nomad in the future. I just would like to get wider tires in the rear. I did install the inboard relocation springs on my 57 HT with 10" wheels, but the Nomad is a bit more complicated. I too mounted my springs in the frame. I have had the car body on and took some measurements. It looks like I'll be able to go just about up to a 12" rim. I hope to have these soon. I'll update this site when I order the rims. I have done extensive homework on this and decided to go the whole hog - 4 link, 9", new tank, no spare. I needed 17" rims to cover my 13" rotors and a 17"rim and tyre will not fit in the nomad spare tire carrier. With a TCI 4 link the nomad tank will not fit but you can lay down any Tri Five tank between the rails. I have laid a flat piece of sheet metal in the cargo area. The wheel scenario is dictated by the chassis rail and inside lip of wheel arch. Most suppliers suggest if you move the springs inboard you can fit 10" of rubber which translates to a 9.5" wheel with the appropriate tyre. I'm not sure a 12" rim will fit unless you tub it. Good luck with your project. I needed 17" rims to cover my 13" rotors and a 17"rim and tyre will not fit in the nomad spare tire carrier. Just mount the spare on the roof. I did a TCI four link on my friends 55 Nomad and we had to use a Ricks tank. Benefit was that it added fuel capacity. We had to remove the spare tire section and it's still a tight fit in there for the exhaust. We are using Airride Shockwaves for the suspension. HTH. I just put an F9 in my Handyman with the original tank, spare tire well and pocketed springs. I took a hammer and bent the lip down a little and now it clears. If you're rear is painted and really pretty, check the clearance there before you let the car down. Thanks for the information guys. I went ahead and installed a 9" rear end and moved the leaf springs in-line with the frame. Probably a good thing because every single item I do costs nothing but $$$$. Guess that's just the way it goes! I recently had a 4 link kit sold by summit racing installed. Don't remember the mfg name but good fit up with no problems. 700R4 transmission, stock rear differential housing, stock fuel tank.